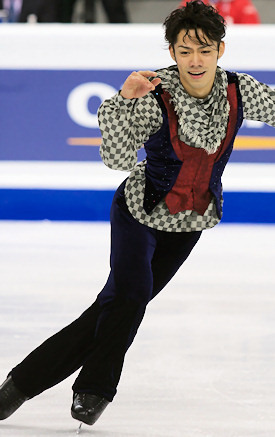 Daisuke Takahashi became the first Japanese man to win the World figure skating title at the 2010 World Figure Skating Championships. Daisuke Takahashi became the first Japanese man to win a World figure skating title, but it was not his first historical accomplishment. He was also the first Japanese man to win the World Junior Championships in 2002, and was the first Japanese man to claim silver at Worlds in 2007. He is also the first, and so far the only Japanese male skater, to medal at the Olympic Winter Games with his bronze medal from Vancouver. Although Takahashi’s talent, powerful technique, and elegance on the ice made him a top candidate for podiums all over the world, his success this past season wasn’t a given by far. The 24-year-old had missed the entire pre-Olympic season due to injuring ligaments in his right knee in a fall during practice in October 2008. As a result, he was off the ice until April 2009. One year ago, he was watching Worlds on TV and was afraid that his dream of a medal at the Olympic Games was over. “Because of my injury, I never would have thought that I would skate at Worlds again, let alone win,” Takahashi said. The inconsistency he experienced last fall showed in the Grand Prix. Takahashi did well at Skate Canada, where he finished second, but his performances at the NHK Trophy and the Grand Prix Final were not convincing. But then he claimed his fourth National title in December. At Worlds, he did it again. Being in the lead, the Olympic bronze medalist attempted the quad flip – a jump that no one has yet landed in competition. The jump was two-footed and downgraded, but Takahashi was pleased that he went for it. “I’m not so keen on doing only quads, but I could do two quads in one program before my injury, and I just wanted to come back to the level that I had before my injury,” he explained. Previously, he had landed two quad toes at the 2008 Four Continents Championships where he scored a whooping 175.84 points. This is still the highest free skating score that ever was achieved under the ISU judging system, surpassing Evgeni Plushenko’s (RUS) current high of 167.67 from the 2006 Olympic Games. Takahashi has been training full-time with his long-time coach Utako Nagamitsu in Osaka since 2008. Before, he also worked with Nikolai Morozov for a few years and split his time between the USA and Japan. Kenji Miyamoto, a former Japanese ice dancer, choreographed Takahashi’s expressive short program to Eye – a modern Tango by the Japanese group Coba. “I’ve wanted to skate to music by Coba since I was in high school. My choreographer Kenji Miyamoto suggested music by Coba and brought exactly this piece that I had in mind,” the skater recalled. Pasquale Camerlengo, a former Italian ice dancer, created the playful La Strada program for the long. It was not a surprise that Takahashi picked ice dancers to do his programs as ice dance is his secret love. When he was younger, he looked up to Oksana Grishuk and Evgeni Platov and Marina Anissina and Gwendal Peizerat. The thing Takahashi was looking forward to the most after Worlds was vacation. He wanted to go to Hawaii, “because I’ve never been there”, but then his focus switched back to his next big goal – the World Championships 2011 in Tokyo, Japan – his home country. “I don’t know yet what will come after that, but if I’m then still not satisfied with what I have achieved, I will continue and maybe suddenly Sochi is already there,” Takahashi summed up. At the same time, however, Takahashi feels the pressure of the next generation. “The juniors are doing very well, including Yuzuru Hanyu, who won the World Junior Championships. I myself feel that I can’t be satisfied with where I am now, and I’m always threatened by these younger skaters,” the World Champion admitted. Right now, he is still the one the next generation of Japanese skaters looks up to and aspires to follow.